Dark Tonic Games Studio: Legends of the Brawl on BrightLocker! Legends of the Brawl on BrightLocker! BrightLocker is a brand new site you should definitely check out if you're a gamer. At its heart it's a way to connect game devs with game players & fans. Ask devs anything you want, check out dev video streams, see the newest info on a game, and support devs by snagging cool in-game or physical loot, and some exclusive stuff you won't find anywhere else. 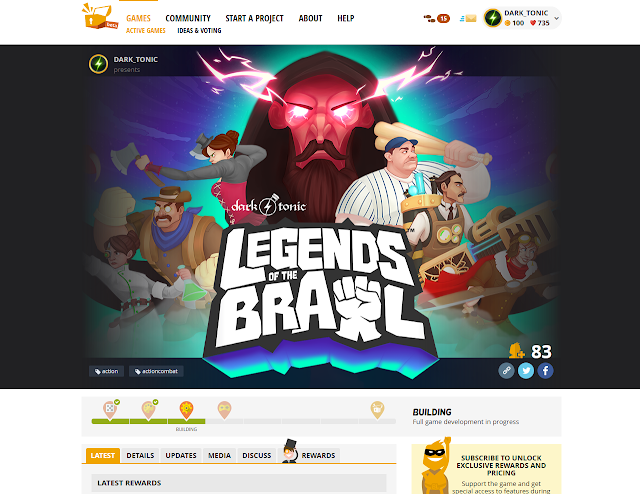 The site has just launched, and we were lucky enough to be one of the few games on from the beginning. We really like what they're building and see it as a great way to engage with our players.